The Apple iPad Mini and the 4th generation iPad are on pre orders and will start on sale from December 8th. 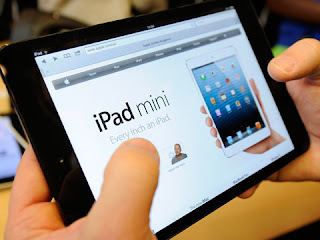 So guys check your budget and plan for the iPad Mini and the 4th generation iPad in India. Cellular version of the 16 GB iPad mini are listed on Saholic.com. They will be available for purchase after 8 December. 2) while the Wi-Fi+3G version will cost Rs 29,900. 3) and the 64 GB (Wi-Fi only: Rs 43,900; Wi-Fi + Cellular: Rs 51,900). 5) 5 MP rear camera. 6) 1.2 MP front-facing camera for FaceTime. 7) 16 GB / 32 GB / 64 GB internal storage, no expansion slot. 2) Dual-core A6X with quad-core graphics. 3) 5 MP rear auto-focus camera. 4) 1.2 MP front-facing camera for FaceTime. 5) 16 GB / 32 GB / 64 GB internal storage, no expansion slot. The iPad Mini would be cheap in coming days don't worry, as the technology is increasing day by day the newer products will make the price of iPad come down. You would be amazed to see the price difference of Galaxy Note 2. By the way you can see the ecoATM post of the blog for all your old phones that will fetch you money.